How were the Diwali celebrations? Shopping, decorating home, having fun with friends and family, making (or ordering sweets) et al. I wish you all a happy and prosperous Diwali and a very Happy New Year ahead. 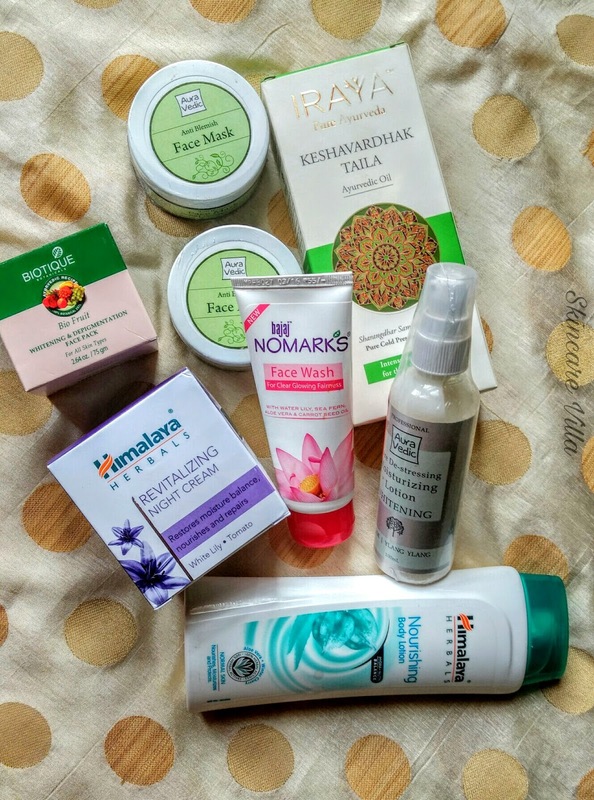 With all the ongoing festival sales on major shopping portals, I thought of buying some products. Out of all the products only 3 are repurchases and other products are first timers for me and from various brand. Moreover one order is from Amazon, other one is from Purplle and one from hypermarket 😁. Let's get into the haul. Let me tell you all that I have shopped for some random outfits. Also I thought of wearing my favourite saree for this festive season. Also did I tell you, for the first time I prepared Diwali sweets all by myself (ofcourse with the guidance of my Mom 😉). Sorry, we were talking about my random festive haul. This is my second repurchase. However maybe my skin condition this face mask just makes it right. All my pimples, zits, acne marks it heals all 😊😊. When I tried this mask for the first timd when I was sent a PR sample. Thereafter once I repurchased, but with the ongoing sales I thought of stocking it up. It cost me 162 INR per tub on Amazon. So I bought 2 tubs 😁😁. I was looking for a budget friendly night cream from a long time. I had earlier used Fuschia Garden Lavender Night Cream and liked it very much, but it's way beyond my budget 😢. I didn't even think twice before buying this when my favourite blogger Nivedita from Makeupandchitchat.com suggested me to use this. Already using it and so far it works like a charm. While we all experience 3 seasons all around the year, my hair know only one season, Fall 😢😢😢. With my ongoing hairfall problem, I thought of giving this a try. If you might be following my blog regularly you might know I very rarely review haircare products as I am scared of experiments on hair. Let see how this works, will be posting full review soon. I have never tried any Biotique product so this is my first stint with the brand. Hope this product turns out well for my skin. Will be posting a full review after using 😊. I simply added this to my cart as these days my dry hands needed a light body lotion. After using handmade soaps I am not much into lotions. Again this is from my favourite brand Auravedic. Basically I didn't read the whitening effects of this lotion but I didn't purchase it with anything as such in mind. I so so love this facewash. I have already reviewed it on my blog. I thoroughly liked the facewash and when again I spotted a new packaging I immediately grabbed it. I love how my skin experiences lesser breakouts with this one as compared to other facewashes. It is a second repurchase for me 😊. I have repurchased it for second time (a bigger bottle) and I love the subtle fragrance of this lotion. I have to still review the lotion on the blog. So stay tuned for this one 😊. So this was my small haul for this festive season. I was tempted to buy many other things, but since I haven't emptied any products, I refrained from buying random stuff. Also let me know if you want any particular review from above mentioned earliest, will try posting soon.